Manchester Center, VT – July 23, 2012 - For the past three years, Digital Wish has been studying the process of implementing one-computer-per-child programs in 28 schools. Digital Wish is an educational non-profit on a mission to bring technology to American classrooms in order to prepare students to thrive in the global economy. The team just completed a $1.125M Federal ARRA stimulus grant, delivering computers, weekly educator trainings, a complete IT curriculum, and support to the 28 schools. Their trainers modeled the entire process of technology adoption and progressively reduced the initiative planning time from 18 months to just 6 weeks, saving schools tremendous amounts of time and money. Both teachers and students are reporting a wide range of gains including increased engagement in learning, technological proficiency, and dramatic improvements in the understanding of internet safety issues. The 2011-2012 data report is attached. The 3-year research project yielded a complete IT Curriculum based on ISTE’s NETS standards, that easily meshes together with the core topics. Eric Bird, Lead Trainer said, “In order for a technology curriculum to be successful, it has to be non-invasive. Teachers can’t just drop their core subjects and teach technology as a separate subject. Technology has to work together with their regular lesson plan regimen.” Based on 28 site deployments, Digital Wish’s trainers packaged all the presentations, worksheets, videos, and lesson plans – so that other schools could easily replicate the program. Starting in 2008, Digital Wish spent over a year researching successful and failed 1:1 computing initiatives. This intensive research period resulted in the identification of eight essential components which must be addressed in order to build a sustainable 21st century learning program, including leadership, investment, hardware, connectivity, training, curriculum, IT support, and community engagement. The absence of even one component creates a much higher risk of new initiatives failing further along in the process. With endorsements from major educational associations of principals, school boards, superintendents, IT coordinators, NEA teachers union, and training centers, Digital Wish raised $152,000 from private foundations like the A.D. Henderson Foundation to fund four pilot sites in the 2009-2010 school year. Across the pilot classrooms, trainers experimented with sharing computers between students, employing mobile labs and computer carts, and creating comprehensive 1:1 computing environments. Because the Digital Wish team found that learning gains were so much greater in schools using one-computer-per-child, they abandoned shared computing and mobile computer lab models altogether, and pledged to only support 1:1 initiatives at scale. Technology utilization doubled and even tripled across subjects for students and teachers, with the largest utilization increases in English and research. Within 3 months, comfort levels with computing increased in every classroom. In partnership with the Vermont Council on Rural Development, Microsoft, Dell, and many others, Digital Wish was awarded $1.125 million in stimulus funding to implement their School Modernization Initiative across 24 more schools, as the education component of the e-Vermont Community Broadband Project. The trainers constructed six curriculum units based on the National Educational Technology Standards for Education (NETS.) Digital Wish teachers then went into classrooms in 24 schools to teach both educators and students how to safely and efficiently use current technologies to learn and demonstrate their knowledge. “The first site took eighteen months of planning from our first contact with the school, to passing out computers in the classroom,” said Heather Chirtea, Executive Director of Digital Wish, “Our 28th deployment reduced the entire planning process down to just six weeks! We have systematized everything possible from press releases, parent letters, and policy documents to curriculum.” These curriculum units are now available nationally as individual units, or as part of the Digital Wish’s IT Curriculum Series. Internet Safety - Over 50% more teachers reported they are now very comfortable with Internet research and safety, increasing from 40% to 63%. Skills - Teachers say that less than half as many students are considered beginners with computers, a decrease of 13 percentage points from 23%. They consider approximately 1/3 more students to be advanced computer users, a 10 percentage point increase from 25% pre-deployment, to 35% post-deployment. College - Students who plan to go to college increased from 89.1% to 90.7%, a 1.6 percentage point increase. Collaboration - The number of teachers who are now comfortable with collaborating with peers, parents, and/or students using digital tools increased from 83% to 93%, a 10 percentage point increase. In one-computer-per-child classrooms, students view the computers as “their own” and therefore take better care of them. Computer breakage rates are lower and behavioral infractions have been significantly reduced. Socio-economic barriers are no longer relevant as students from different socio-economic classes who would have never previously worked together, are suddenly collaborating on classroom projects. New student leaders have begun to develop from all levels of the social strata. Some of the largest gains have been made by low-achieving students and students with educational disabilities who tend to be more visual learners. The replication phase included 12 schools from the implementation phase as well as one new school in an urban environment in Nashua, NH funded by a grant from Dell Powering the Possible. The same resources that were developed during the implementation phase were then used to replicate the program the following year. Internet Safety - After completing the Initiative, 93% of teachers now say that they are comfortable with Internet safety, with 67% of them saying they are very comfortable. Problem Solving - Students who say they can “figure out just about anything on their own” increased from 38% to 51%, a 134% increase. The number of students who say they have participated in ten or more technology projects that required them to solve a problem, gather information, or draw a conclusion, has nearly doubled, from 23% to 42%. Creativity - Teachers now say that 46% of their students are experts or peer coaches in creating a new idea or original project using technology, a value that almost quadrupled the pre-initiative’s mere 12%. Skill - Teachers reported that only 11% of their students are considered beginners with computers, a decrease from 30% pre-initiative. They consider approximately 50% of their students to be advanced/expert computer users, a value that has more than doubled since the 20% pre-deployment. I have noticed much more student confidence on the use of technology. Motivation to do the work has been invaluable. In addition to classroom training during the school day, 196 students from 11 of the 13 replication schools participated in after school programs created by Digital Wish trainers with software donations sponsored by Microsoft. High school students and even Dell employees acted as mentors to elementary school students to help them create video games using Microsoft Kodu gaming and websites using Expression Web. 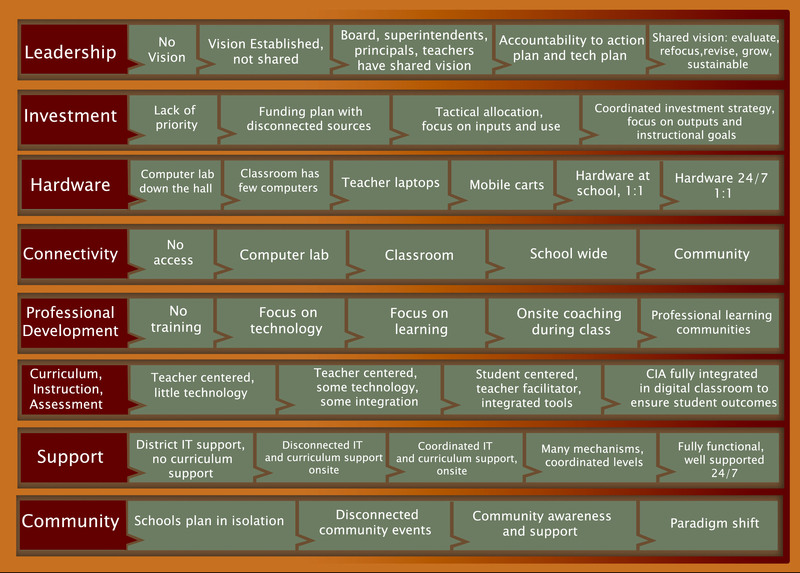 In a post-mortem evaluation of the four 2009-2010 pilot schools, each one scaled up their technology programs within 12 months of Digital Wish’s arrival. One town voted to increase their school’s technology budget from $5,000 to $50,000 in the following school year – ten times the amount originally allotted for educational technology. Teachers are already requesting support as a wide array of devices find their way into the classroom through the students’ backpacks. Digital Wish is seeking funding to continue the research, translating their successful computer curriculum to work with student-owned mobile devices. Digital Wish is a nonprofit bringing technology to American classrooms in order to prepare students to thrive in the global economy. At www.digitalwish.org, teachers make technology wishes, and donors make those wishes come true with contributions. Since August 2009, Digital Wish has granted over 29,000 classroom technology wishes through its online network of over 56,000 teachers, and delivered over $12 million in technology products to American classrooms directly impacting over 500,000 students in all 50 states.